Sign of the times as my Regiment lays up the Standards of 5 of its squadrons (3 having been disbanded), one of which – 48 Squadron RAF Regiment – I commanded from 1992 – 1994 … there are days when I wonder about British government spending priorities as I watch our political class divert £400 million per year of our taxes in to funding unemployed EU migrants – whilst at the same time casually ripping our armed forces to shreds … something isn’t right here … small wonder, perhaps, that I’ve joined UKIP. 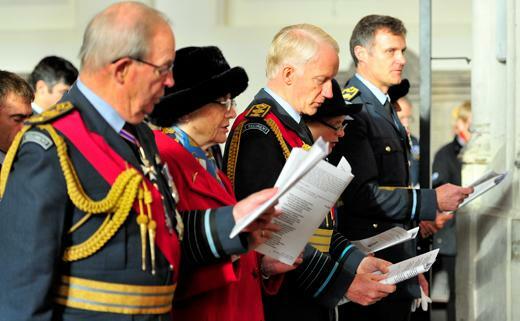 It was kind of the Regiment’s new Honorary Air Commodore, Sir Stephen Dalton, to say, “The RAF Regiment are at the pinnacle of Britain’s Armed Forces and are renowned for their professionalism. But they are also a strong family …”. Indeed, a strong family we are, our lamentable political class notwithstanding. To a British politician a “strong family” is all about the aforesaid politician using your taxes and mine to cover his weekly shopping bill and the cost of heating his second home (itself funded by your taxes and mine). Offline I need to know the prognosis for your unit old fruit … should I know already?